I’ll hold my hands up now. I played my part in passing on this gem of a put-down to the next generation. All I can do is apologise. Eat three huge helpings of humble pie. Pray that my own children are wiser parents than I was. Of course, once upon a time I was the initiator of the conversation. Only I’d read four books before breakfast instead of watching DVDs. Maybe that’s why I spent half a lifetime and more thinking I was boring. I admit my life hasn’t been as overtly exciting as many. I can count on my fingers the number of times I’ve flown. Unless you record return journeys separately. I’ve never tried skydiving. Free running. Paragliding. Skiing. Surfing. Not even a half marathon. Ten pin bowling is as extreme as sport gets in my world. I bet you don’t know anyone else who’s broken their arm in a bowling alley. No. Really. I did. I’m not big on hobnobbing with the rich and famous either. Could be because the whole concept of celebrity’s a bit lost on someone who believes in equality. I did meet a famous footballer in Bourne and Hollingsworth once. During the 1966 World Cup. Buying a pink bridesmaid’s dress. Not him. Me. My mother got his autograph. I can’t remember his name. Oh, and a drunken mate of my then boyfriend poured beer over my feet in a north London pub one evening. A dubious pleasure. I believe the perpetrator owns the Daily Express these days. Definitely not someone I’d want to admit to having met. My soul’s about to notch up a few more points. If confession really is good for it. Over the years I’ve often envied people whose lives seemed more interesting than mine. Who’ve been to exotic places. Had exciting careers. Been happily married. Done worthwhile things. Changed people’s lives. Made a difference. I’ve compared myself to them. Thought my life boring. Written myself off. Come to think of it, is there anyone out there who’s never felt that way? Honestly? Just recently I’ve been wondering if I haven’t got it all wrong though. The other morning I was walking to Tesco’s. Doesn’t sound much fun? Bear with me. I saw a lady I know slightly heading towards me. With a bright red poppy. We stopped to chat. It’s become quite hard to walk any distance in this city without bumping into someone I know. 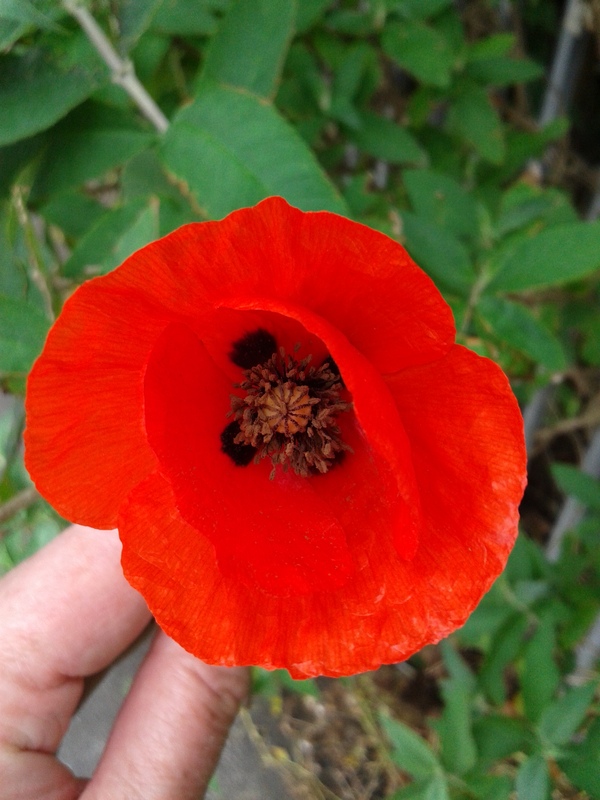 As we made to continue on our separate paths, she handed me the poppy.